FREQUENTLY ASKED QUESTIONS and THE DETAILS. Q: Can I get in free? A: Maybe! Two people can request free admission when they RSVP, in return for a half hour of cleanup help at the end. Q: How long has this been going on, and who else is doing it? 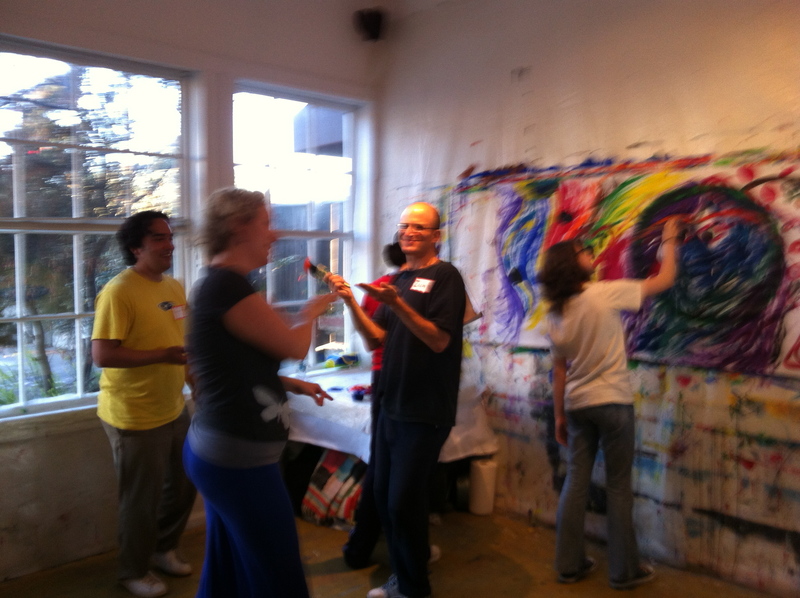 A: We hosted ten painting and dancing events in Berkeley during 2007-8. Unbeknownst to us, painter and hunger awareness activist Matt Jones began hosting Paint Dancing events in his Seattle studio and gallery in 2007. Matt has since spread his vision to other metropolitan areas. When we saw what Matt was up to, we were inspired to join in! See PaintDancing.com for more about Paint Dancing, and read press coverage. It is Matt’s vision to have Paint Dancing events throughout the Bay Area and around the world. We are thrilled to be the first hosts of the region and are committed to helping others expand the dream! Q: I’m not good at dancing (or painting), and I’m afraid I’ll feel inhibited and judged. A: We can’t guarantee how you’ll feel, but we can guarantee that you’re not alone in those fears. Lots of us share those feelings to some extent. In our community, feelings like this fade away pretty fast. Q: What if I just want to dance (or just want to paint)? A: In any moment, you’re free to dance, paint, or do both at the same time. Q: Do I need to bring a partner to dance? What if I want to dance on my own? Where do people dance? A: No, you don’t need to bring a partner. Some people dance while they paint, in front of the painting-in-progress tacked to the wall. Some people dance out on the dance floor, away from the painting areas. Some people choose to dance solo – as part of the crowd; others choose to dance in partnership or in spontaneously-forming small groups. It’s up to you. There is no “wallflower” area for standing around – everyone is always painting, dancing, or doing both. A: No. We provide a helpful labeling system so you can decide and control if you want to paint solo or join in a collaborative creation. Q: Can I take my paintings home? A: Yes. If you co-create with others, you’ll have to cross that bridge when you come to it. Paintings left behind are reused or recycled. Q: Is this a class to learn how to paint or dance? A: No. But you’ll learn something new if you come ready to paint and move. Q: Why do you donate 25% of your profit to Alameda County Community Food Bank? A: International Paint Dancing founder Matt Jones is committed to reducing hunger (he also founded the anti-hunger group MashedPotatoes.org, and we share his vision that we can do good deeds for the community while doing our funky and creative thing. Q: Why isn’t the exact location posted here? A: The exact location, in west Berkeley, near the Gilman exit off the 80/580, is only given to people who RSVP. Too big a crowd would spoil our event. Let us know when you RSVP if you’ll be using a chair.Looking forward to our next gathering, Your Berkeley host, Beth Hird. Beth holds a Master of Fine Arts Degree, and has been teaching art since 1986 (see https://dancingpaintbrushstudio.com/ and http://www.Elizabethhird.com ).